If you know or suspect that your home has termites, DO NOT PANIC… There are solutions available to you. Begin by educating yourself. An educated consumer is a smart consumer. Many homeowners will start with a web search. There are numerous sites that will give you information concerning termites, termite treating methods, and product ratings. We recommend that you speak with your neighbors, friends, and co-workers first. Most everyone knows someone in North Texas that has had a home with termite problems. Secondly, solicit several bids and compare. Do not let price or the salesperson make the decision for you. There are no “pie in the sky” treatment methods. Termites are tenacious, and require a thorough initial treatment and follow-up to insure that they are no longer a problem. Become familiar with “Conducive Conditions” in and around your home that can encourage termite infestation or re-infestation. Understand”Conducive Conditions”, and correct them prior to an infestation. It can greatly enhance your protection; can save you a lot of money, and frustration. If you find or suspect that your home has termites, do not self-treat with over the counter baits. The termites must be terminated from the structure first. Let the Label be your guide. Read it and ask questions. A properly treated home is your best means for effective termite control. Remember, it is the technician treating your home, who puts down the termiticide in the right places, and at the proper rate, not the salesperson. Building a new home, or adding on to an existing one? Think Termites! Ensure you have it properly pre-treated. Many homeowners first termite experience involves “Swarmers”. Termite Swarmers are the colony’s reproductive system. They normally occur after spring showers, after the sun comes out (temperature, humidity, and light), (mid March through June) and Late Swarmer Season (end of August through September). Emergence generally occurs during the middle part of the day. They do not eat wood, but for many, are the first signs of an infestation, and can cause a lot of panic and expense. “Termite workers” perform the damage, but they are seldom seen. 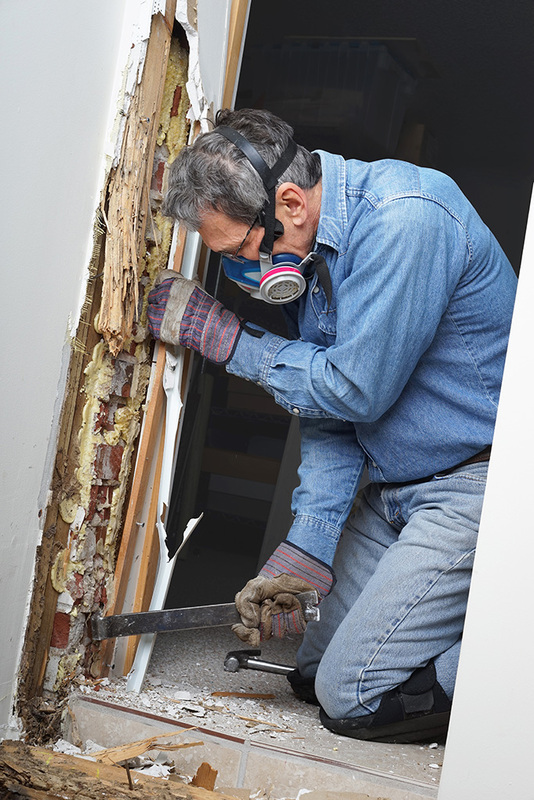 The damage done by termites is a slow, but continuous process. Termites work every day, all day, and will continue to eat at cellulose material until they are terminated from the structure. The best time to treat for termites is before you get them, or as soon as you think or suspect that, your home may be infested. An average size colony of subterranean termites will eat approximately one 2″ x 4″ x 8′ piece of wood per year. Subterranean termites live in colonies composed of thousands of individuals. In order for the colony to live as a unit, there is a division of labor among three distinctly different types of castes within the colony. Reproductive’s, (males and females), soldiers, and workers. Workers do the damage, are wingless and chalky white (sterile), and are by far the most numerous individuals within the colony. Their main function is to provide food for themselves and other colony members. Even though termites consume cellulose, they cannot digest it without the assistance of protozoan’s present in their gut. These small one-cell animals break the cellulose into simpler compounds (humus) that is utilized by the termite colony. When can you expect termites? In North Texas unless a home is properly pretreated, you can expect termites. When, can depend upon the type of soil, how it was used previously, activity in the neighborhood, and conducive conditions in and around your home and it depends on how vigilant the homeowner is. Get to know termites before they get to know you. A Subterranean Termite Colony can have in excess of a million termites. Taking precautions can save you a lot of money and frustration. Inspect the exterior slab for mud tubes coming from the soil, check corners carefully. Tubes can be smaller than 1/8″ in diameter. Look for dirt in wood trim and wood veneer. There are many things a homeowner can do to discourage subterranean termite activity. Termites need cellulose material, moisture, and have a low tolerance to moving air, and light. They like to operate in out of the way places. Check your home to see if there are or were any form boards left in or around the foundation. The soil level should be kept below the brick shelf or wood siding. Never stack your firewood against your home. Try not to put any storage sheds, brick, or woodpiles against your home. Repair any leaking water lines as soon as possible. Check your landscape timbers and fence to see if it is termite infested. If you find termites, replace the wood, treat the soil, and keep the wood from direct contact with the soil. Remove dead shrubs from around your home, termites love them. Have your home inspected at least once a year. Just because a company has been around for a long time, it does not mean the person doing the work has. Are they trainees, technicians, or certified applicators? It could mean the difference in getting rid of termites. Our technicians are all qualified and experienced; we pride ourselves on staying up date with local conditions and solutions. A loose mortar joint, a minute space around a plumbing pipe, or a settlement crack in your home foundation is all a termite needs to gain entry (1/64″). Prices can range from several hundred (for a spot treatment) to thousands of dollars for an initial treatment. Remember price alone does not guarantee a termite free home. It is the Product, the People doing the work, and Persistence. Some termite treatments will require access panels/doors be installed adjacent to bathtubs to get at and treat the bath trap on slab built homes. Have one properly installed early, and have the area inspected once or twice a year. (The area under the bathtub is very conducive to termites.) With Alcon Services new foaming equipment and treatment process, we generally no longer need to cut access panels. Most termite companies will inspect your home free of charge. Is the person giving you the quote a Salesperson or a qualified technician? In our case, it will always be a qualified technician. Walk with the person doing the inspection, look, and do not be afraid to ask questions. Think of termites whenever you buy a new home, are remodeling, adding an addition, changing carpets, etc. Remember any inspection is a visual inspection, and the inspector can only look for signs. The more a person can see inside your home, the better the inspection. Do not let anyone use scare tactics, or high pressure to persuade you to make a decision. Feel comfortable with the price, person, and company you plan to do business with.